With education town halls and listening tours over, what’s next for the West Virginia Legislature? 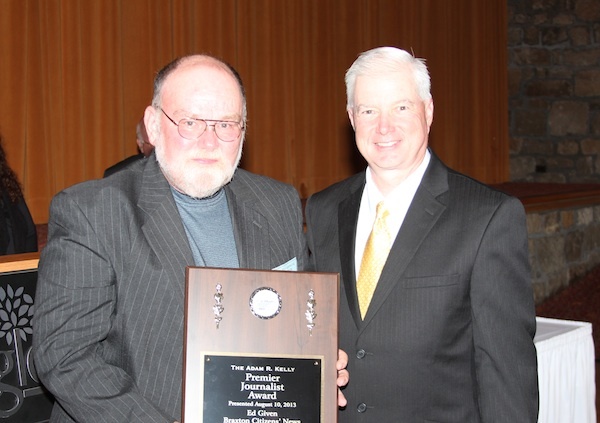 WHEELING, W.Va. – Ed Given, publisher of Braxton Citizens’ News in Sutton, was honored with the Adam R. Kelly Premier Journalist Award by the West Virginia Press Association during its annual convention at Oglebay Resort, Aug. 10. The award is the highest individual honor bestowed by the state’s oldest press organization. It’s given in recognition of his service to newspapers in the state, the West Virginia Press Association and to his local community. A committee of past presidents of the WVPA selects the Premier Journalist. The award was established in 1991 in memory of the late Adam R. Kelly, former owner and editor of the Tyler Star News in Sistersville, W.Va., who was known nationally for his outstanding service to newspapers. For more than two decades, Given has been a leader in the West Virginia Press Association, having served as WVPA board member, president and now as a trustee of the WVPA Foundation. Given has been a member and chair of the WVPA Legislative team, helping direct the Legislative Committee’s efforts at the Capitol and around the state. He has also served on numerous other WVPA committees, including the nominating and convention committees. He and his wife, Jeanine, are major supporters of the fundraising efforts for the WVPA Foundation, which awards scholarships and internships to West Virginia College students. “One might say that Ed Given is an outstanding publisher of a small town newspaper. However, he is and always has been a hard-nosed truth seeking reporter at heart – challenging his community to deal in the truth and transparency with its people. When the adage was coined that it was the duty of the press to hold the governing class accountable for its actions, someone must have envisioned Ed Given, for no one does it better than he. “However, Ed is also one of great compassion and a dedicated servant to his community and its people. Ed has served them in a multitude of capacities providing leadership in so many ways while rolling up his sleeves and doing the physical components of work in and about the community – whether in the capacity of volunteer fireman or in emergency services. West Virginia Delegate Tim Armstead, minority leader in the House, grew up in Sutton and worked in Given’s print shop for a period. Armstead said Given was proven leader and dedicated advocate for the people of West Virginia, adding that Given always answers the call, be it a need for help from a neighbor in Sutton or a committee at the Legislature in Charleston. Given started the Braxton Citizens’ News in 1976. In the decades since, while running a newspaper, printing operation and serving numerous roles for the WVPA, Given also served Sutton as a council member, as mayor and was a leader in both the fire department and EMS squad. During a lifetime in Braxton County, Given has also served with numerous committees, boards and scholarship programs. The Givens are residents of Sutton and celebrated 40 years of marriage on July 27. They have three children, Crystal Given, Jamie Given and Allison Nettles, and seven grandchildren, Mykalea Given, Madison Groves, Samuel Groves, Carly Given, Reese Given, James Nettles and Ava Nettles.